A typical cattle farm near Gobabis. South Africa is in the middle of a severe outbreak of foot-and-mouth disease. Although it's not harmful to humans, it causes mouth ulcers and foot lesions in hoofed animals such as cattle, goats and camels, making them lame. The disease can spread very fast because it's highly contagious. The only way to prevent the spread is to restrict the movement of animals and to prevent infected animals from having any contact with others. FMD occurs in over 100 countries worldwide, mainly in Africa, Asia, the Middle East and South America. Over the past two years there have been outbreaks in Mongolia, Russia, India, Israel, Ethiopia, Kenya, South Africa and Zimbabwe. In 2013, India had the worst outbreak in a decade, with over 64,000 infected animals and 6,100 deaths. The main cause of the spread was because animal movements weren't being effectively monitored. South Africa has started to restrict the movement of animals in affected parts of the country, as it's the best way to contain the outbreak. But it's a huge blow to the country, which produces around USD$145 million worth of exports in red meat annually. Agriculture contributed R72.2 billion (about USD$5billion) to the country's GDP in 2015. The outbreak also affects Namibia, Botswana and eSwatini, who rely on South African meat imports. There is another, less economically damaging way of controlling foot and mouth disease: the use of traceability systems. These have been used effectively in Namibia to map out which areas need to be quarantined and manage the movement of livestock. The system tracks animal movement, identifies all animals uniquely, monitors animal health, assists in disease control and manages feed. Because it's so efficient, traceability is now a requirement to export meat to the EU and America. 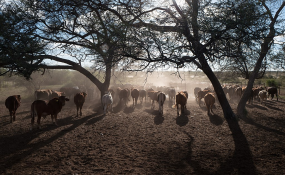 In Southern Africa, Namibia, eSwatini and Botswana already use national livestock traceability systems - but South Africa doesn't currently have a system in place. A major factor in Namibia's success was that it had a fully functional traceability system, known as the Namibian Livestock Identification and Traceability System in place. This system was able to identify the affected areas using Google Maps which enable officials to identify the focal point of the disease; in other words, where it was first identified. This area was then quarantined. The next step was to quarantine the animals' shared food and water resources with infected animals. It's a complex process that's made easier with the use of a electronically-based system - but only if all the necessary data has been uploaded. The full extent of South Africa's outbreak still needs to be determined. As Namibia's fairly recent experience shows, a national traceability system would make a big difference in allowing the country to track and manage the disease. This could save animals' lives and help get this crucial part of the agricultural economy moving again.